I Love My German Shorthaired Pointer Laptop - Messenger Bag. Showing how much you love your German Shorthaired Pointer can now be proudly diplayed on the outside of this Laptop Bag. 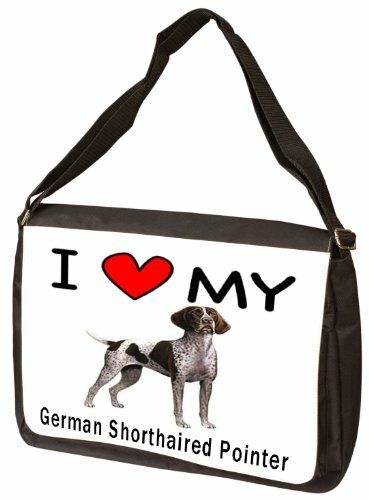 I Love My German Shorthaired Pointer Laptop Bag is perfect to be used when carrying your laptop, ultrabook, homework from school, papers from your job or supplies for a picnic. Enjoy showing the true love you have for your dog by taking this bag wherever you go! Size: 15.75" x 11.25" x 2.75"
This Messenger bag offers plenty of space to store all your school or work supplies - Makes a Great Gift Item! If you have any questions about this product by MyHeritageWear.com, contact us by completing and submitting the form below. If you are looking for a specif part number, please include it with your message.